So in part 1 we talked about the devices I have purchased, now let’s dive-in and talk more about the implementation. So I need the network to cover two and a half floors (roof is a half floor because it has two rooms). 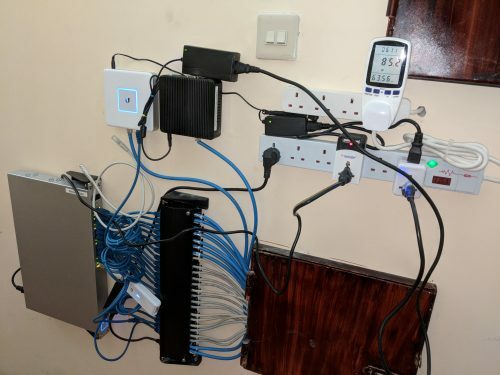 Each floor has around ten Ethernet wall plug and two/three access points. There’s also few cameras around the house, nine on the ground floor and four for the other floors. To have a good network and wireless speed I have to pay careful attention to the backbone implementation of the network. So while I’m upgrading my home network infrastructure I’ve decided to also upgrade my current in-wall cables from Cat 6 to Cat 6A for future proofing. I have plans for purchasing a server and a separate SAN in the near future to expand and upgrade my home lab and media servers. So next how many core switches do I need? With the number of required ports and because of having small size in-wall cable pipes, I have settled with two 24 ports switches (US-24-250W) for each floor except the roof. I would’ve preferred the US-48-500W with 10 gaigabit SPF+ ports for a backbone network switches but those 48 ports are more than twice what can be fitted through the cable pipes. All cable pipes end up on the stairwell and they’re distributed in a such a way that each floor pipes ends up on the stairwell of the floor above. So ground floor cable pipes end up on the first floor stairwell. Therefore, core-switches are placed on the stairwell for each floor. I couldn’t replace all Cat 6 cables because cable pipes are too small so for some points we couldn’t fit in another Cat 6A cables. Also I’ve decided to connect two cables between each core switches and home lab for Link Aggregation and faster speed. A month later I’ve decided to add UPS to my home switches and gateway which in turn provides power to all my PoE devices (small Unifi switches, AP, and cameras). 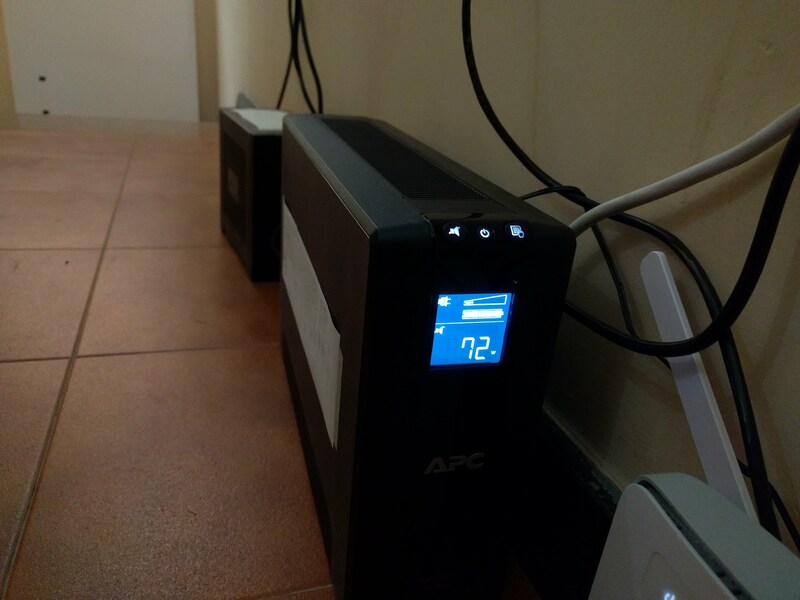 Should provide at least 40mins of backup power with my latest test. I bought also another bigger UPS for my NVR/Media server to keep everything running and recording when there’s a power outage. I’m planning to increase the UPS run-time in the future when I can budget for it. As you can see on the pictures above I’m using patch panel for two reasons; to keep the cables tidy and minimize touching any core cables to increase longevity. 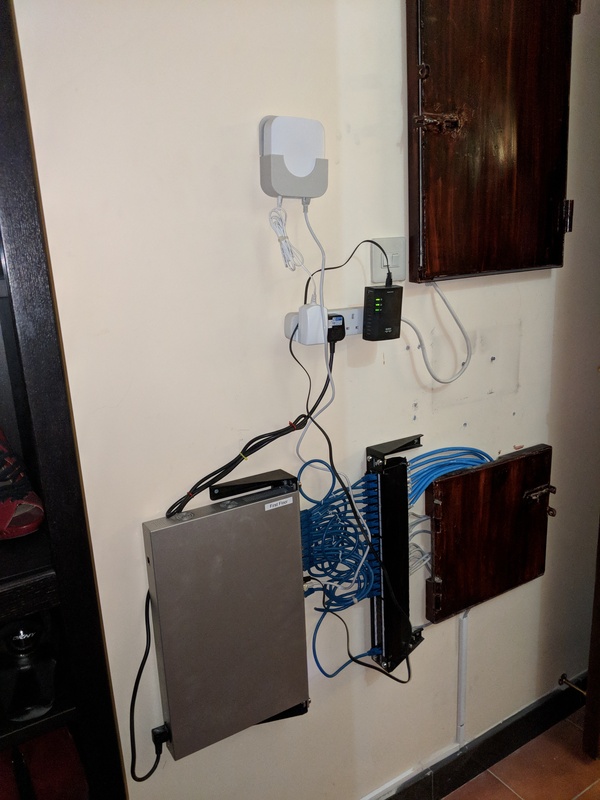 Maybe it’s an overkill for a home network but at least it feels more professional and I’m proud of it.